How to Clean Up iTunes Library? The Easiest and Quickest Way! iTunes is the primary source of iDevice users to store different types of media files. When you use your iDevice for a period of time, your iTunes library becomes disorganized and messy. 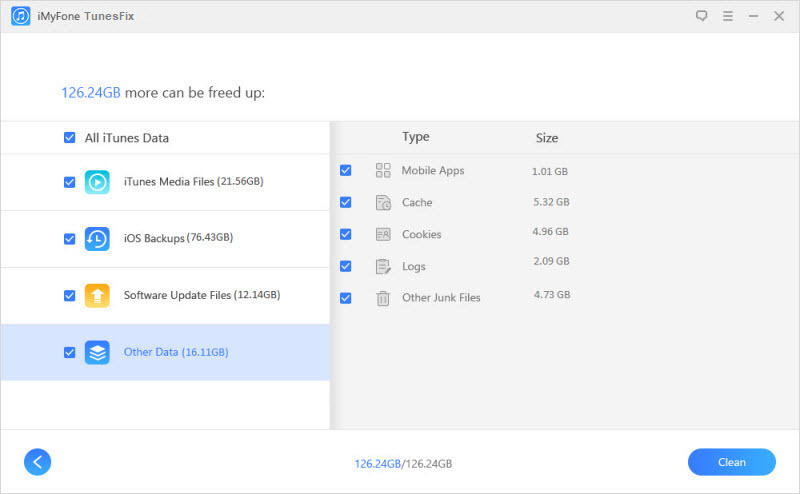 Because of this, managing your music and other media files becomes a hassle as there are duplicates, songs without proper tags, metadata, album artwork, etc. So you need to clean up iTunes library to get rid of the duplicates and make your media collection organized so you can manage it properly. There are a number of ways to do this. If you are looking for how to clean up iTunes library easily and the quickly, then it is highly recommended that you use iMyFone TunesFix. It is a professional tool that has been designed to help iOS users fix many iTunes issues in the most convenient way possible. 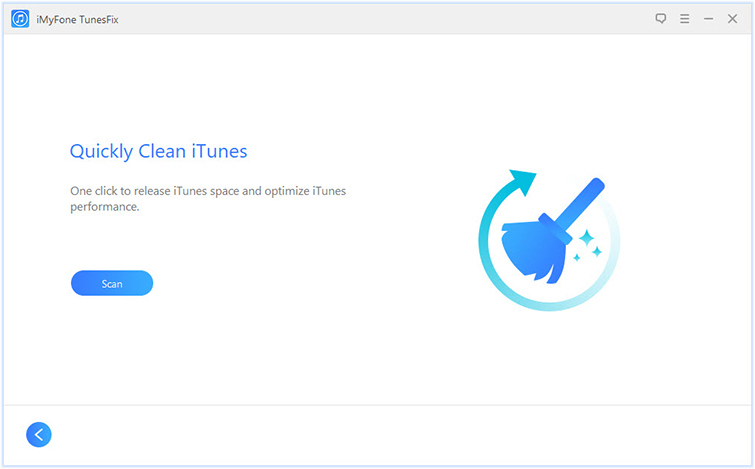 Although TunesFix is mainly an iTunes repairing tool, it is also equipped with advanced iTunes cleaning features such as Quick Clean and Deep Clean that can help you clean up your iTunes library and get rid of unnecessary iTunes files with a single click. Step 1: Launch iMyFone TunesFix on your computer. The tool will scan for iTunes issues upon launch. After the scanning is finished, repair any problem that has been detected via the Repair button. If no issue is found, then the home page of the TunesFix will open. Step 2: From the home page of TunesFix, click on the Quick Clean mode if you wish to delete iTunes update files, backups, or media. Now click the Scan button on the next page. Step 3: After the scan is finished, select the media type that you want to clean up and then click the Clean button. Step 1: Launch iMyFone TunesFix and once its initial scan is finished, follow the on-screen instructions to repair the detected issue. You will see the home screen of TunesFix afterwards. Step 2: From the home screen of TunesFix, select the Deep Clean mode if you wish to remove iTunes backups made by third-party softwares. Click the Scan button on the next screen. Step 3: After the scanning is finished, choose the type of files that you wish to clean up and then click the Clean button to start the cleaning process. Step 2: Navigate to File > Show Duplicate Items via the menu bar of iTunes. A list of all the duplicate items will appear. Step 3: From the list of duplicate items, select the songs that you wish to delete and then erase them to clean up your iTunes library. Alternatively, there is also an option to get rid of all the duplicates at once. You can use that option to save time and effort. iTunes automatically recognizes your albums and updates their artwork. But if for some reason it doesn’t, then you should select the individual songs and then navigate to Advanced > Get Album Artwork option and the album artwork will be updated. If a song has the wrong artwork, then right-click on that song and select Clear Downloaded Artwork option to clear it and then download it again. Cleaning up the iTunes library is a task that should be repeated from time to time. If you keep it well-organized, then you will be able to manage your songs, podcasts, audiobooks, TV shows, movies, etc. easily and properly. Once your iTunes library is neat and organized, you should make a habit of keeping it that way. Whenever you import new tracks into your iTunes library via File > Add to library option, delete the original tracks that iTunes copies from your computer’s hard drive. When you import a new album into your iTunes library, make sure that album contains all the metadata you would like it to, instead of letting unedited songs pile up.